Ryder Cup hero Philip Walton heads a 12-strong Irish contingent bidding to win European Tour cards in Spain. The Dubliner, 44, will be making his eighth successive visit to the stomach churning Qualifying School since 1999. But this is the first time he will have to come through the preliminaries of Stage Two, where 310 hopefuls are chasing just 80 places in this month's Finals at San Roque. Walton will be in action at Emporda in Catalunya, one of four qualifying venues, where the top 20 will progress to next week's six- round finals. He's joined in today's first round draw by Michael McGeady, David Mortimer, Stephen Browne and Damian Mooney with former Amateur champion Brian McElhinney in action at nearby PGA Catalunya. The other six Irish hopefuls are in action in southern Spain with Ulsterman Michael Hoey and David P Jones set to tee it up at Costa Ballena Club de Golf in Cadiz. Eddie Barr, Peter Martin, Simon Thornton and Challenge Tour regular Colm Moriarty are at Sherry Golf in Jerez. And Moriarty is hopeful that he will be inside the top 20 at his venue who will progress to the finals, where the top 30 and ties earn their full European Tour cards. After a disappointing season on the Challenge Tour, the Glasson Golf & Country Club professional needs a good week. 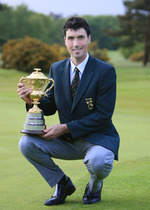 He said: "I think that now I am better placed in terms of my swing to achieve my goal of playing on the European Tour. "Obviously there are certain hills to climb over the next month but I am confident that I can do it." 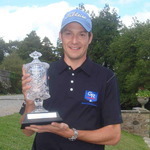 Ryder Cup hero Philip Walton has entered next week's European Tour School in Spain - for the EIGHTH time. Seven of Ireland’s 12 challengers broke par at Stage Two of the European Tour Qualifying School with four of them inside the qualifying places after the opening day. Simon ThorntonA total of 304 players are competing at four venues in Spain with a total of 74 spots up for grabs in next week's Final Qualifying Stage at PGA Golf Catalunya where the top 30 and ties after six rounds will earn full tour cards. Simon Thornton (68) and Colm Moriarty (69) are inside the top 18 at Sherry Golf but while Mick McGeady (71) is just two shots outside the magic number, David Higgins (72) and Eddie Barr (74) have more work to do. An impressive Niall Kearney fired eight birdies in a superb, six under par 66 to clinch his place in this week's European Tour Qualifying School finals. The 21-year old Walker Cup player was one of five Irishmen to come through stage two in Spain, finishing two shots behind Sweden’s Fredrik Ohlsson in brilliant share of second place on 12 under par 276 at Costa Ballena near Cadiz. Crisis? What crisis? No fewer than 41 Irish players have stumped up the €1,600 entry fee to follow their dream and enter the First Qualifying Stage of the European Tour School. The wailing wall. The scoreboard at the European Tour Qualifying School Final Stage tells the harsh truth.Philip Walton compared it to a prison sentence and there’s no time off for good behaviour. If it goes well, you have six rounds - 108 holes of golf - to finish in the top 25 and ties and earn a ticket to the 2013 Race to Dubai.